Log in as an administrator and go to Plugins > Add New. You can install the plugin by uploading the plugin file you have obtained from our Downloads section. Download the plugin file there, then click the Upload Plugin button and choose the plugin’s zip file, click the Install Now button. Settings – We’ll have a look at those below. You won’t even have to change anything there in most cases. Content Blocks – This will lead you to the section on the WordPress Dashboard where you can create and edit WYSIWYG Content Blocks that can be used freely with your theme’s sidebars, using shortcodes and within PHP templates. Sidebars – This link brings you to the Sidebars subsection of the Content Blocks menu, where you can create and edit your custom sidebars. 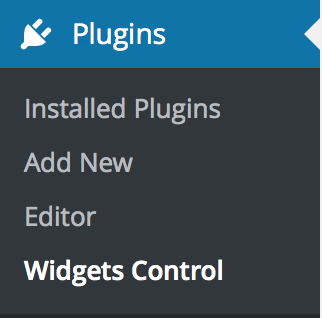 The Widgets Control plugin is basically setup-free. You can disable the features related to Content Blocks if desired, although we certainly recommend to leave that enabled. It also provides an option to have the cache cleared automatically when updates to the widget structure are detected. This option is disabled by default and caching systems get better at recognizing changes so you might not even need to use this option. Anyhow, if you desire to have the cache cleared automatically while you set up your widgets, you can enable this option. The plugin provides very useful WYSIWYG Content Blocks that spare you the need to install any additional plugins. This adds a new post type which is available to the Administrator role and those roles that can access theme options (more technically, those roles that have the edit_theme_options capability). This way we assure that only those with the right credentials can add new content blocks or modify existing ones and add them to the site’s sidebars etc. As with the content blocks, you have the option to disable everything that the plugin provides to create and use new custom sidebars. You can disable this feature if you really aren’t going to use it, but we recommend to at least give it a try. You can even create content blocks and custom sidebars to display them on specific pages on your site using shortcodes. It works with W3 Total Cache, WP Super Cache and WP Engine’s caching system. To enable automatic cache clearing, go to Plugins > Widgets Control and enable the Automatic Cache Clearing option. Once you have set up your widgets, it is recommended to disable the option to avoid unnecessary cache clearing which can impact your site’s overall performance once it is production-ready.